I've long had a theory that every comic series must be somebody's favorite. I may never have been a big Captain Atom fan, but gosh darn it there must be somebody out there who has every Captain Atom issue, and fainted dead away with joy when Captain Atom: Armageddon was announced. And I figure the same must be true for Space Ghost. The trade, while not terribly awful, was unfortunately not for me, but I do grant that there must be someone out there, somewhere, who's seen every Space Ghost episode and read every Space Ghost book, and for whom the Space Ghost trade has a vaunted place on their shelves. Well, I can appreciate that, even if I can't concur. 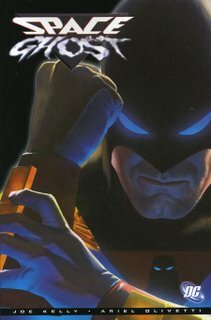 Space Ghost begins with Peacekeeper Thaddeus Bach joining his planet's special forces unit, the Wrath. When his boss, Temple, murders someone on their first mission, however, Bach defects, and his wife is killed in revenge. Temple beats Bach and leaves him for dead, but he's found by a hermit who nurses him back to life and, eventually, reveals a hidden weapons stash. Bach pursues Temple, seeking vengeance, but when the planet Meridian is attacked by a bug-species, including their leader Zorak, Bach chooses redemption instead. He adopts two orphaned children, Jan and Jayce, and takes on the secret identity Space Ghost. I looked up Space Ghost on the Internet right after I finished the miniseries, hoping to discover how neatly the Space Ghost comic dovetailed into the cartoon. I was sadly disappointed. There are slight bits -- Thaddeus is Space Ghost's first name on the Coast to Coast cartoon, he visits a Ghost Planet of sorts in the comic, and he gains a wise mentor as mentioned, apparently, in only one old Space Ghost comic -- but the ties are tentative at best. And it's even hard to equate the scheming Zorak from the cartoons with the planet-ravaging race of Zorathians in the comic; at best, this is hardly Space Ghost's origins, but more a re-imagining of the concept as a whole. The other difficulty with this story is it's overarching generality. The back of the trade very nearly tells the whole story: A policeman finds out his force is corrupt, he becomes a renegade and swears revenge and ... yup, he finds redemption in the end. Frankly, had this same character landed on a planet where the wise old alien gave him comet-weapons instead of ghost-weapons, this could have been an origin for a new Captain Comet. Or Plasma Man or Space Cowboy or what have you. It's an archtypical, general origin, pasted on to a character we don't know that much about, with very little tie to the small amount we do know about the character ... well, nothing plus nothing kind of ends up with nothing. To be fair, I do see Joe Kelly's point, that this is essentially just "two-fisted ... pulp science-fiction," and if that's all you're after, there is something to love here (and we all know how I honestly enjoyed Kelly's other work). Kelly's got plenty of weird and exotic aliens in this book, and it's all beautifully illustrated by Ariel Olivetti. Maybe it's just the Infinite Crisis curse ... *sigh* I tried to take a break, but if it's not a tie-in trade, it's just not the same. It's a sickness, I know. On the other hand, one policeman in the trade does quip, "You have the right to ... shut up!" so maybe a little criticism's not completely misplaced. And there are even rumors of a Space Ghost sequel which, this review aside, I actually think I'd read. More on that if or when the book comes out. For now, I best get back to DC-land; maybe some Bat-titles on the way, or perhaps the lead-up to Rann-Thanagar. We'll see. There's not much tie to the old cartoons, letting the author here make a totally different feel for the story than those cartoons. It is a very pulpy feeling, an di enjoyed that. The unoriginality was there, and I looked at it in terms of using an archetype story to relate to a long-past era. It's not spectacular, but I enjoyed it. At least Zorak has a reason to want revenge on Space Ghost in his first appearance. One Year Later Insignia on OYL trades?